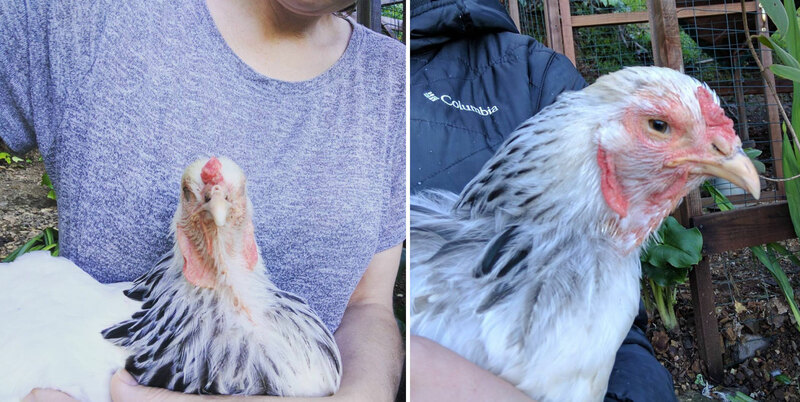 Mochi is a three-year-old Light Brahma hen who developed cataracts in both of her eyes when she was around six months of age---causing her to lose her eyesight. 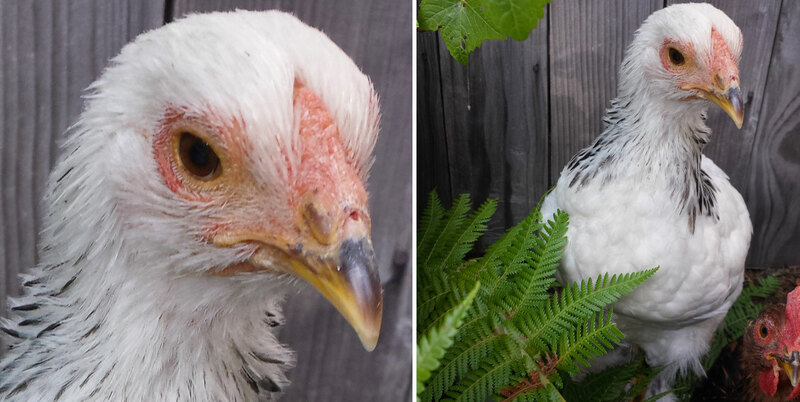 Laura Pedersen purchased Mochi, and her sister Dottie, as young chicks from a local Feed and Grain store in Concord, CA in February 2014. Of the two, Mochi was the only one who was affected by the cataracts. 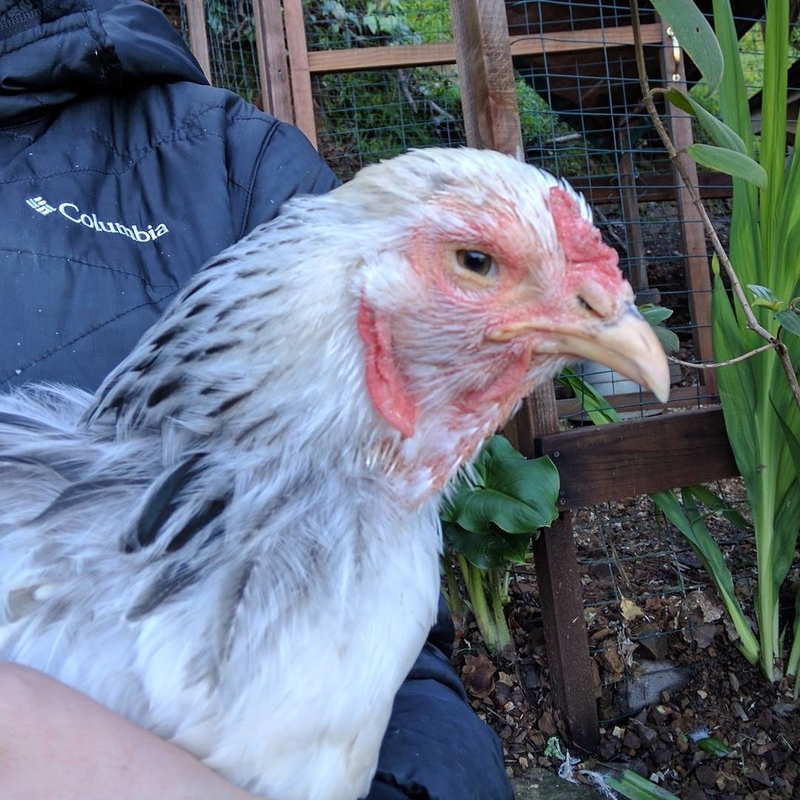 There are different reasons chickens can develop cataracts, however being a Light Brahma, she was actually more at risk of developing cataracts. 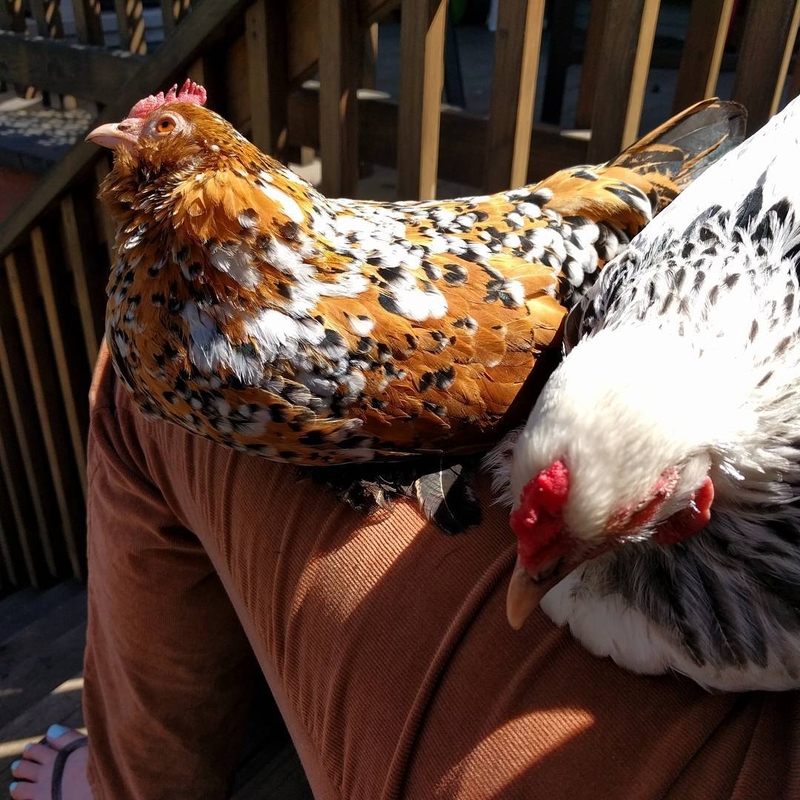 In 1991, one study revealed that 69% of the cockerels and 15% of the pullets in an inbred flock of approximately 200 dark and light Brahma chickens had cataracts in one or both of their eyes, and crooked toes; the chickens had been normal until all of a sudden at six months of age they developed cataracts, with or without crooked toes. Laura first realized that there was a problem with Mochi late one afternoon in August 2016. Mochi was foraging for bugs and bits of grass while free ranging in the backyard. However, something was off about her---she kept periodically bumping into objects. In order to get a closer look, Laura offered the hens’ treats in her hand---as she normally would do. Usually, all of the hens would get at least one treat each, however this time was different---Mochi wasn’t fast enough to get even a single treat. Upon closer inspection of Mochi, Laura realized that there was a visible whiteness—or in other words, clouding of both of Mochi’s eyes. It was so strange, because Mochi had seemed fine the day before---it was almost as if the cataracts developed overnight. 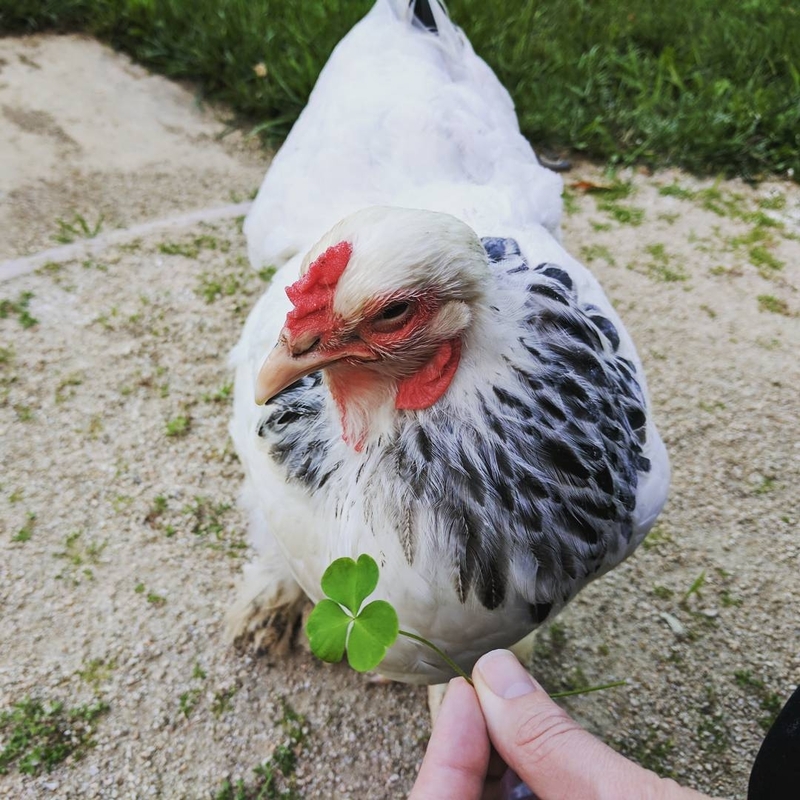 Although Laura suspected that the problem was cataracts, she didn’t know for sure, and regardless, she wanted to make sure that the hen was otherwise in good health—so she made an appointment for Mochi with the Montclair Veterinary Hospital. 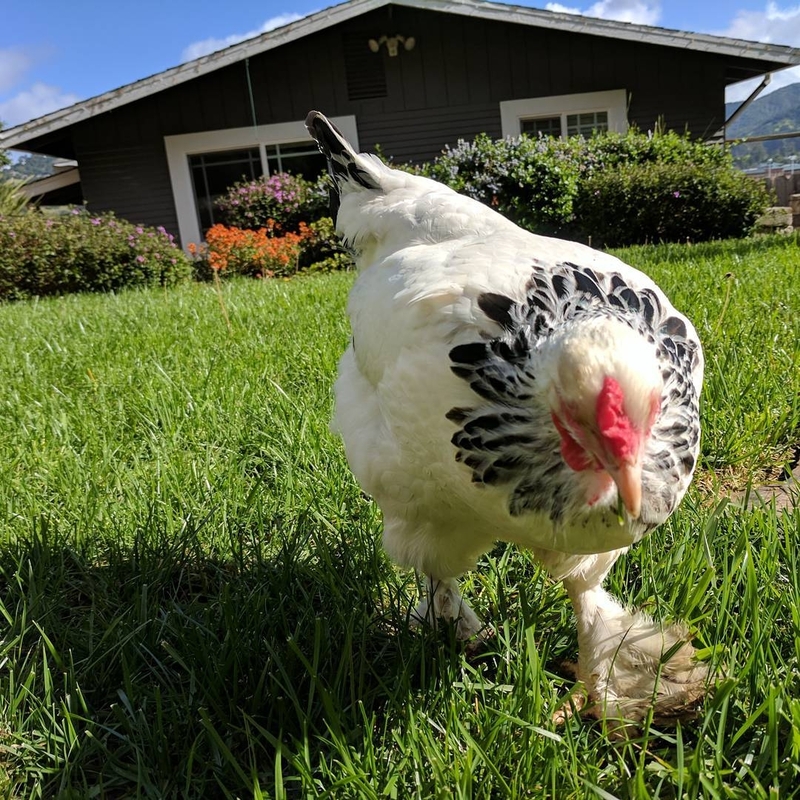 Upon arrival at the veterinary hospital, Dr. Cynthia Lynn asked Laura questions about the hen’s history, and performed a physical exam on her body. Other than the cataracts---which Dr. Lynn confirmed Mochi did indeed have in both eyes---she was otherwise in excellent health. Laura took the opportunity to ask the vet some advice about how best to care for a blind chicken. The Dr. Lynn explained how two of the most important things were to monitor Mochi to make sure that she was getting enough food and water, and to ensure that she made it back to her coop every evening—for she would be easy prey for a predator. Similar to humans, blind chickens use their hearing differently and ascribe meaning to sounds that chickens that aren’t blind might not care about. This same concept also applies to memory---a blind chicken will use their memory differently than a “sighted” chicken (a chicken that isn’t blind). An example of this concept was demonstrated by Mochi and her “sighted” flock mates. Whenever the hens are in an open space together, the “sighted” chickens regularly make small noises to let Mochi know that they were nearby----they were talking to one another. 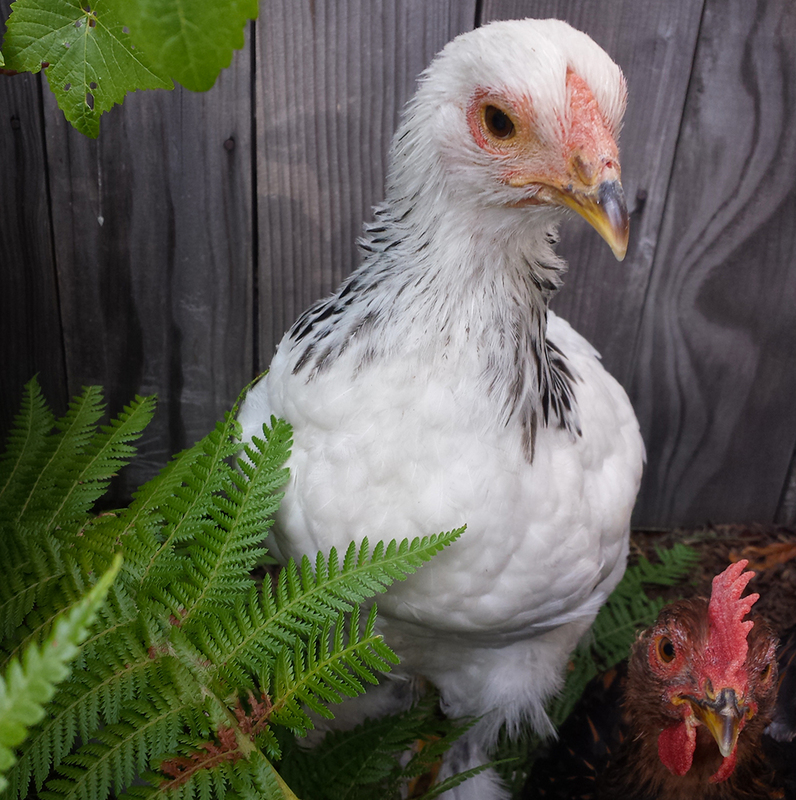 Whenever the “sighted” hens wander a bit too far away, Mochi makes an “anxious” vocalization. 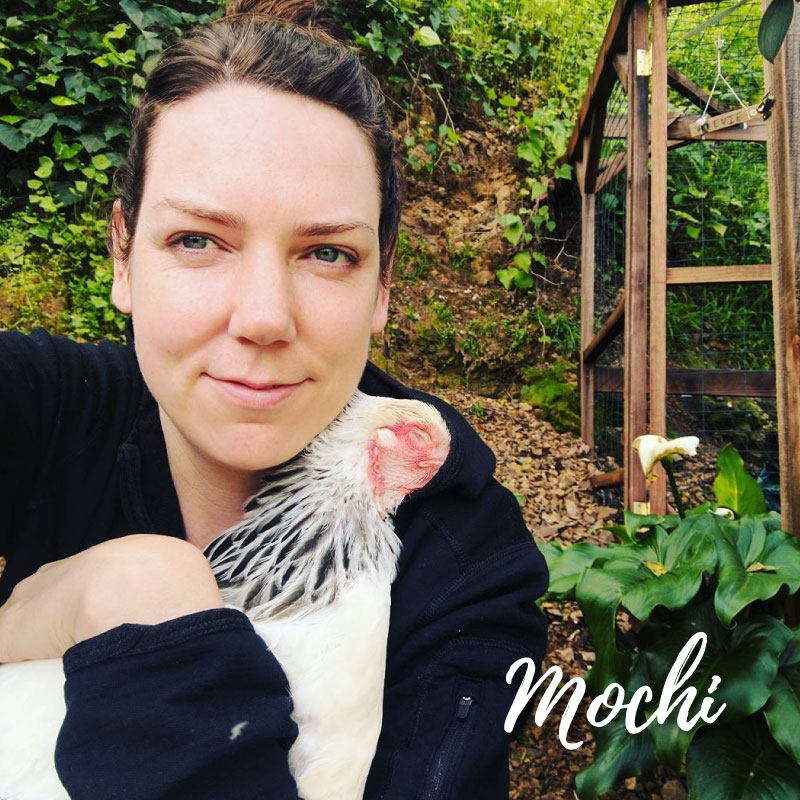 Since whenever the girls free range, they have their human out there with them, whenever one of them hears Mochi’s “anxious” cry—they pick her up and move her closer to the other hens. Something to emphasize is that a chicken that is born blind or vision impaired, is going to require slightly different management changes and care as opposed to a bird that was born with their full vision, but lost it later in life. Chickens that become blind may require a little more effort to help teach them orientation and mobility, through applying consistency and routine. 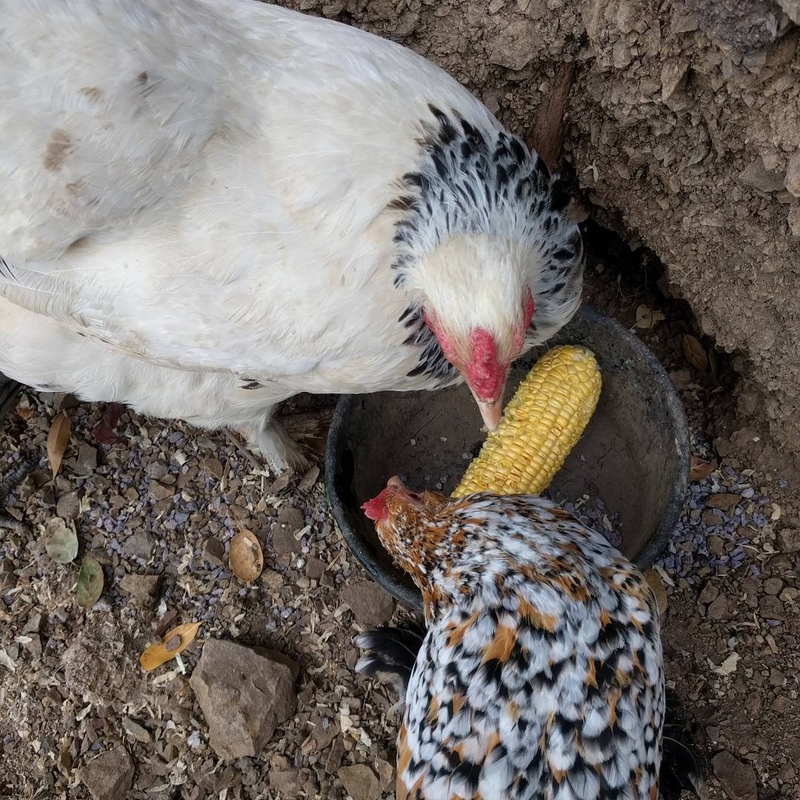 Ensure water and food is easily accessible and consistently placed in the same location.Prior to Mochi going blind, whenever Laura refilled the chickens’ food and water dishes, she would sometimes place them back in a different area. However, now that Mochi was blind, it was going to be important that there was consistency with the location of the food and water---so Mochi would always know where it was. 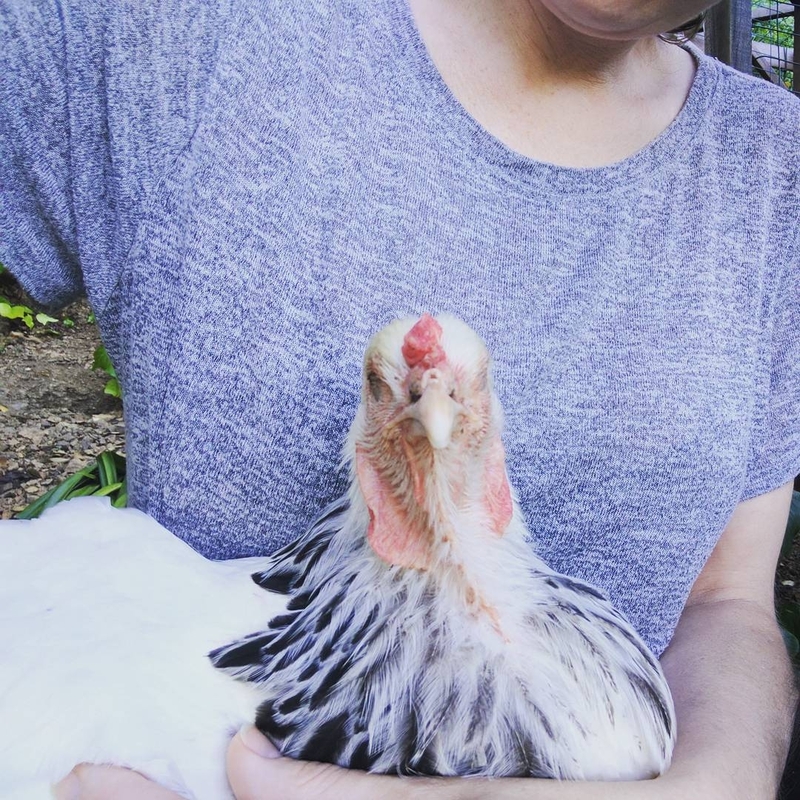 Teach orientation through executing occasional ‘reminders’.At first, Laura would have to occasionally “remind” the hen where she was, with respect to her orientation---in order for her to develop a sense of where to go to access food and water. In order to teach the hen, Laura would place the hen in front of her food and water dishes and tap on them---enough to generate a sound that Mochi could hear, which prompted her to take a drink or eat from the container. Keep a watchful eye out during rain storms or other continuous, noise-generating events.Laura came to realize that if the weather called for rain that she would need to keep on active lookout for Mochi---in case she required assistance getting back to the coop. This was because the noise from the rain appeared to disorient Mochi and made it hard for her to find her way to shelter. Be prepared to help intervene if there are any deviations to the normal routine or environment.Another event in which Mochi required some additional support was when the Pedersen family moved to a different house. Since they were relocating to a more rural area, Laura and her husband were concerned about the possibility of predators getting to the chickens—raccoons, hawks, coyotes, dogs, cats, etc. In order to minimize the risk of a predator attack on their birds, Laura’s husband built a new, predator-proof outdoor enclosure for the birds which was directly connected to the coop. The plan was that they would still secure the birds up in the coop at night, and then open it the next morning so that the birds could have access to the outdoor enclosure during the day. The flock were still provided with plenty of free range access---however only in supervised sessions, when one of their humans was outside with them. The chickens’ new setup would also be safer for Mochi, as just in case it rained and there was for whatever reason a delay in finding her, she would still be safe in the outdoor enclosure. 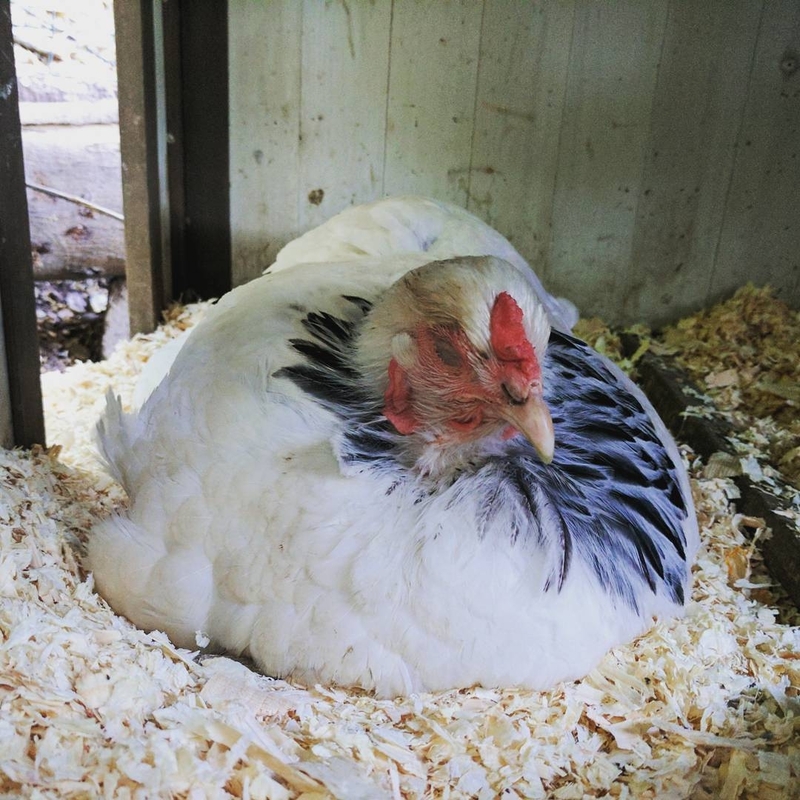 However, because everything was in a different spot than it was before, Laura anticipated that the hen would require some help adjusting to the orientation of the new layout and location of her food and water. She kept a watchful eye on the hen, but were actually quite surprised at how quickly Mochi adjusted to her new surroundings. Take time to observe interactions between flock members, especially after any changes in flock members. When Mochi first developed the cataracts, the flock consisted of just her and Dottie. Dottie and Mochi got along ok—there was no aggression experienced between the two. However several months later, the Pedersens inherited Evie, a one-year-old black copper maran hen, which brought the flock count up to three. However, Laura soon noticed that of the three, Mochi was getting a few feathers pecked here and there by the other two. They weren’t being overly aggressive, but they were not placing as nice as Laura had hoped. 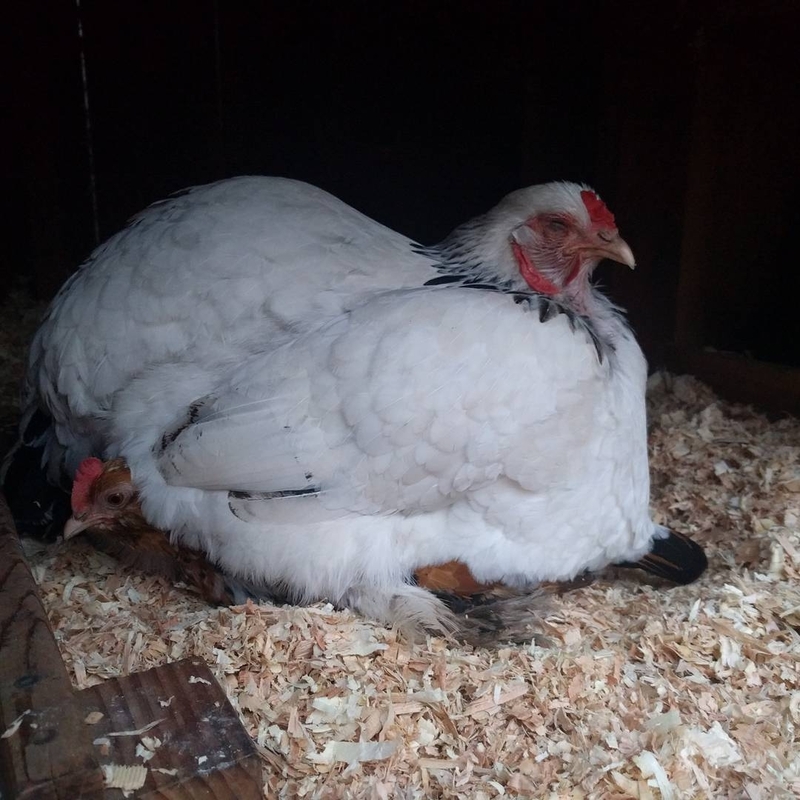 Therefore, the Pedersen family decided they should adopt another hen to hopefully give Mochi a friend and ally. Petunia---a bantam Mille Fleur Bearded d’Uccle soon joined the flock. Petunia and Mochi were instantly best friends and were inseparable---they would hang out together all day and Mochi even sleep on top of Petunia at night. Unfortunately, there was a recent tragedy that occurred to the flock---Petunia was killed in a vicious predator attack—even in the specially designed, predator-proofed enclosure that the Pedersens built. It is suspected that the predator was probably after Mochi but since Petunia loved her dear friend so much, that she died protecting her. Since Petunia’s death was fairly recent, Laura has been keeping a watchful eye on the interactions between the three hens. 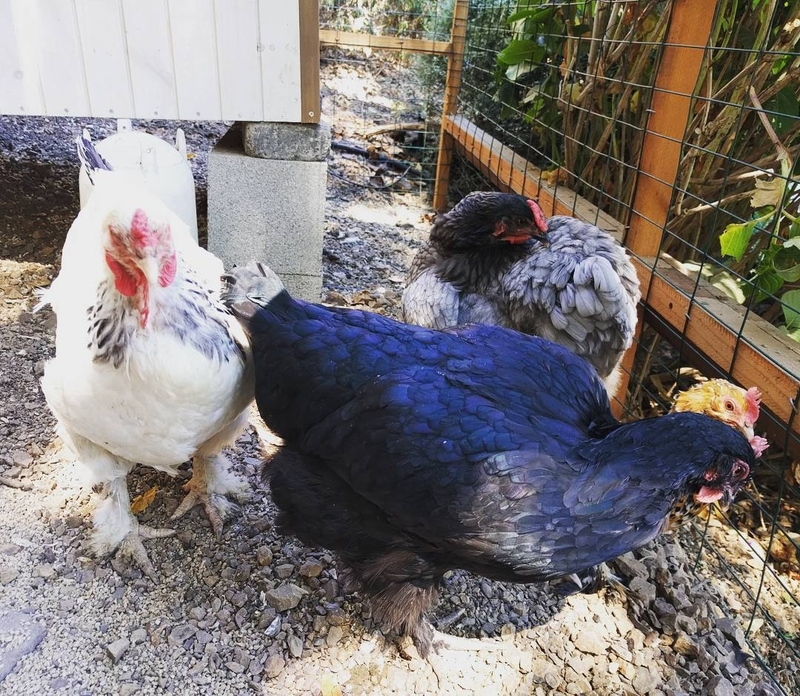 The Pedersens have unfortunately noticed that the Dottie and Evie have been slightly ganging up on Mochi again, similar to the behavior exhibited before Petunia came into the picture. As such, Laura is considering adding another bird to the flock to even things out again. However, in the meantime, Laura makes sure to spend special one-on-one time with Mochi, who very happily cuddles in her arms. Mochi happily foraging in the yard and cuddling in Laura's arms. Dr. Cynthia Lynn grew up in Minnesota, where she had a wide variety of pets growing up. After attending Carleton College in Minnesota, earned a master’s degree in chemistry from Yale. She subsequently attended U. C. Davis, where she earned her Doctorate of Veterinary Medicine with honors in 1997. Dr. Lynn's first job was at Montclair Vet Hospital, working for Dr. Harris, the founder. After moving away for several years, she came back to the Bay Area and MVH, where she has enjoyed practicing since 2005. Her particular interests are dentistry and treating avian and small mammal patients (in addition to dogs and cats). Montclair Veterinary Hospital is a full-service veterinary hospital that is located in Oakland, CA. The hospital has its own in-house laboratory, digital radiographs, and ultrasound machine---allowing for them to provide rapid and efficient diagnosis and treatment to their patients. The hospital cares for a wide variety of animals including chickens and other birds, cats, dogs, reptiles, guinea pigs, rabbits, etc. The hospital has six veterinary experts on staff—Dr. Cynthia Lynn, Dr. Gary Richter, Dr. Bryon Bowers, Dr. Barbara VanGlider, Dr. Dana Thistlethwaite, and Dr. Kelley Cayton.